NSYLA has two former Bryant lacrosse stars in our coaching ranks. Coach Gardner and Coach Porter played for the Bryant Bulldogs. This year the Bulldogs have moved to Division 1, and add #88 Zack Greer, former Duke Attackman, to the Bulldogs lineup. 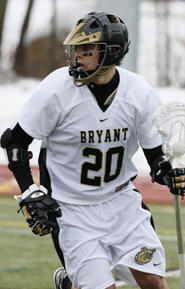 Zack is an All-American who holds many scoring records. Click on the picture to go to their website. Better yet, go see Zack in person, you will learn something about the game!